In this text we will describe the Grand Reef casino. If you don’t know should you play here or not and is it safe (and if you have some other important questions), this Grand Reef casino review would help you. In short words: well it’s up to you. It’s a safe casino with fine bonuses, Curacao license and interesting games. However, there are some problems related to the withdrawal – and we’ll talk about it in more details. Let’s go. Grand Reef’s assortment isn’t the widest among the other casinos. They offer more than 200 games, and it’s more than one player need – but now, when the top casinos offer more than 500 and 600 games, this number doesn’t look good. However, the games are from PlayTech company – it’s a reputable software development company, and even if it’s not as popular as Microgaming, it’s still good. The casino offers slot games, table games and video poker. Unfortunately, there are no live games here, so you can’t play with real dealers in Grand Reef. As the majority of the casinos, this one focuses on the slots. There are classic 3 reel slots and video slots here (more than 20 of them). As for the table games, you can find different kinds of blackjack and roulette in Grand Reef – both traditional and more exotic variants are available. If you like video poker, you can choose among 1, 4, 25 and 50 hand games here. The safety of Grand Reef. Is it a safe and trustworthy casino? It’s licensed by Curacao authorities. This licensing body isn’t as trusted and reputable as, for instance, the Malta Gaming Authority or the United Kingdom Gambling Commission, but it’s still good. Your problems will most likely be solved and your funds are protected by the Curacao laws when you play in the Grand Reef casino. Your personal and financial information is protected here – the website of the Grand Reef uses the latest SSL encryption, so your data won’t be stolen. What is even more important, the games at Grand Reef are completely fair. The TST (testing facility for gaming industry) checks the games here every month, and it means that this casino doesn’t cheat to its clients. It’s fair, and it is very good, because some of the casinos from the top list don’t test their games with TST. The security standards are actually the strong side of this casino. Unfortunately, the same can’t be said about the support service here. What’s wrong with the support team? Do they really support the players? If you have any problems, you can write to the support agents via email or live chat or call them. The problem is: there are many Grand Reef casino reviews from different people, and these people often say that the live chat doesn’t really help. Sometimes the support isn’t online, sometimes the players have to wait too long for their answers, and sometimes they just copy and paste the sentences from the Frequently Asked Questions section. We don’t want to say that you will most likely meet with these problems, but you still need to know about it. The good news is: online chat is available round the clock, and, well, in most of the cases they do really help. 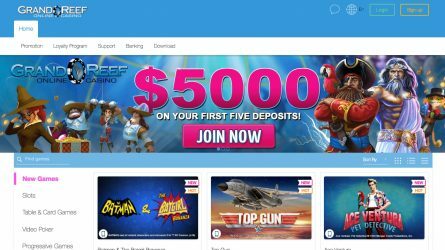 Withdrawal is as important as the licenses and protected website – all in all, when it comes to our money, we all want to get the winnings as soon as possible. And, unfortunately, that’s not what you should expect from a Grand Reef. The first problem is: the pending time is too long. It may take for them more than 1 week to verify your identity and to send you your money. This casino is also notoriously known for the tons of personal documents they require to give you the money. We are sure that’s not how a top casino should perform in 2017. The information at their website claims that the withdraws are proceeded in 1-5 days, and it’s not true in some cases. People say that because of different problems the withdrawal may take up to 4 weeks and even in this case, the casino can pay you half of your money or so. The amount of negative feedbacks from a Grand Reef players is a bad thing, and the withdrawing from this casino is a real problem. We hope they will fix this problem. As for the bonuses, the situation is quite… average here. The welcome bonus is 150% up (no more than $750), the second welcome bonus is 175% up (not more than $875). They also offer free spins on Ace Ventura slot (it’s a quite popular slot machine). The bonuses are very interesting here, with no doubts – but we still recommend to read the bonus terms carefully before playing here. However, when we are talking about the list of the restricted countries, the Grand Reef casino is a true leader. There are 49 (forty nine!) countries, which residents aren’t allowed to play here. It’s a very long list, and it makes no sense to enumerate all of these countries – you just have to know that the citizens of the USA, the UK, Spain, France, Russia, Ukraine, Israel, Poland, China, Croatia and other countries can’t play in the Grand Reef casino.